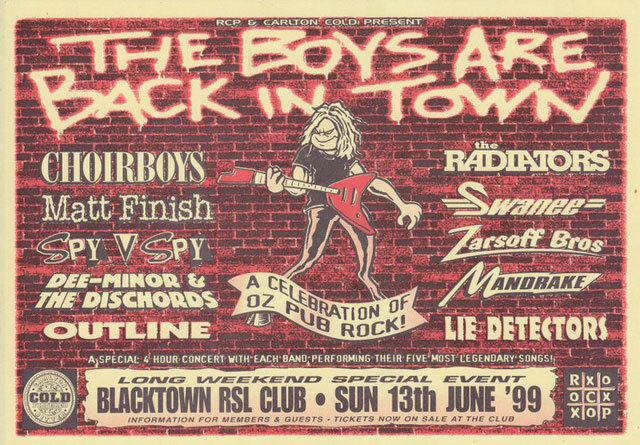 The Boys Are Back In Town was a concert that was the brainchild of long-time Sydney promoters, Rock Circuit Promotions (RCP), and featured some of the great pub-rock bands of the 1980’s Sydney scene. It was held at Blacktown RSL Club on Sunday the 13th of June 1999. What a lineup it was! Unfortunately I wasn’t at this show but I’ve seen almost every one of the bands on this list in their prime and they were all high quality acts. Each of the bands performed their 5 most popular hits in what would have been a marathon concert. I’d really love to hear from anyone who was at this show. Just leave a comment below & tell us how it went. Thanks to Peter “Izzy Foreal” Knox for finding a copy of the flier used above. I attended the Coffs Harbour Ex-Services Club portion of this tour. It was a pretty good night from what I can remember. Loved “The Rads”, “The Zarzoffs”, “Spys” and “Choir Boys”. I can’t remember any of the others although I guess they were all OK because I stayed to the end. Still have my flyer like the one shown here, in a frame with my ticket. Cheers.